REUNION PACKAGE: The new Konkeptoine ReUnion pack includes 4 shaders with a usage aimed at different purposes. Diffractor™: Diffractor is specially designed to accurately reproduce the physical diffraction effect in a simple, fast and efficient way. It includes four tabs full of options to control how your diffracted light look, including special controls to fake the tipical CD reflections in a accurate way (Scratched Reflections, a new reflection model in CG). The interface features also a custom preview and color ramps for a easier of use. 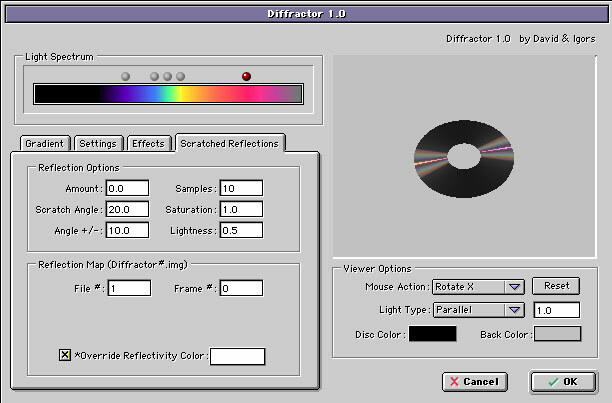 A modest shader in origin, this rebuild is specially designed to create diffraction rainbows with a simple interface. A CD is a popular diffraction example.So we added a set of CD-specific physically correct effects in the Scratched Reflections Tab. The beta-testing added more options to Diffractor's application area: each artist uses the shader for its purposes/taste (typically far away from originally designed diffraction). Diamonds.. physically their subtle colors are not diffractive, they have absolute another nature, but practically it's a very convenient Diffractor's usage. The Scratched Reflections can be used separately to get new interesting metals without any relation with CD's or jewels..
Microscope™: The Microscope shader detects where the pixel density increases (Usually towards object edges) and takes care of it. You can add a color to the most dense zones to fake lots of effects, from landscape depth of field, to microscope images in a easy way. 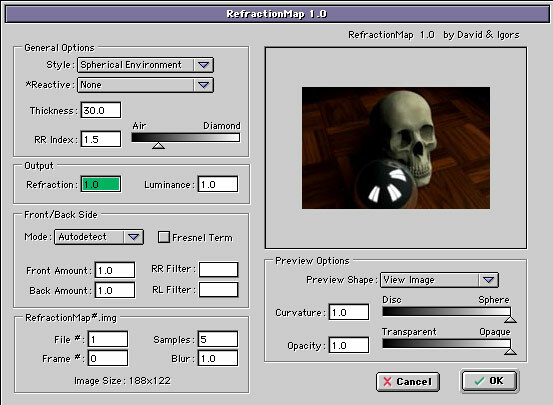 RefractionMap™: RefractionMap allows to fake refractions without Raytracing. Same as you use a bitmap image to fake Reflections to save render time, now you can also use the RefractionMap shader to render fast refractions in Phong shading. Do a render of your environment, add the RefractionMap shader, and render in Phong. Domus™: Ever wanted that cool specular highlight present in PIXAR's award winning "Tin Toy"? Window-shaped speculars? Speculars defined by your favorite image? Here is Domus! The Domus shader can do it for you. With two modes "Window" or "Custom image", the Domus shader will reshape your highlights at your taste. Diffractor™: Shader designed to simulate light diffraction. 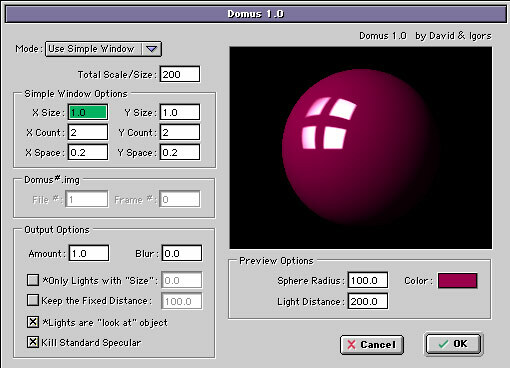 Domus™: Shader designed to modify the specular highlight shape. 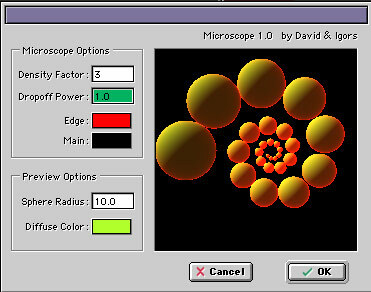 Microscope™: Shader designed to render high pixel-density surfaces. RefractionMap Shader™: Shader designed to fake refraction through the use of a image map.